Jennifer Lawrence is used to stealing the spotlight on red carpets and at awards shows. But for her brother’s wedding last autumn, she was happy to let the bride have her moment. 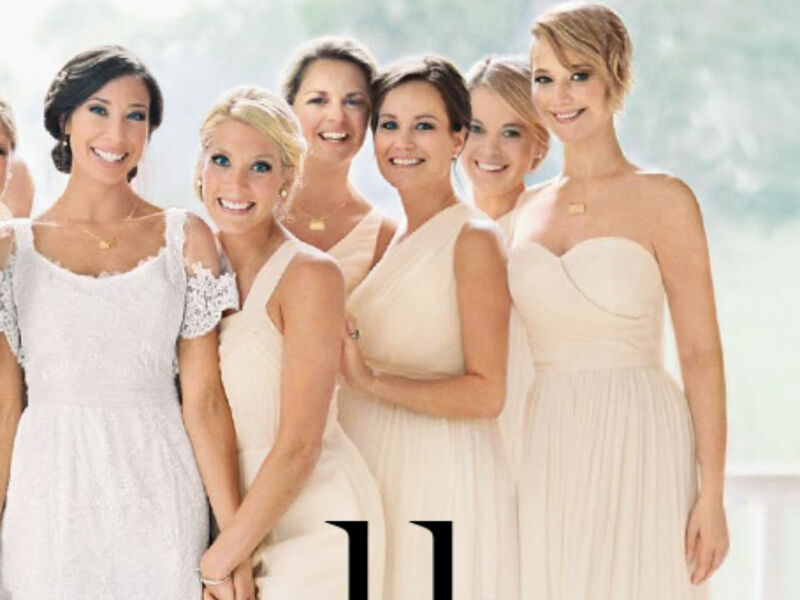 The 23-year-old actress was one of 10 beautiful bridesmaids in the Kentucky wedding, which took place in October 2013. The gorgeous nuptials are featured on the cover of the new issue of Martha Stewart Weddings. In the stunning cover shot, Jennifer and the other smiling bridesmaids crowd around the blushing bride, Carson Massler. All 10 ladies are wearing lovely J.Crew dresses in the same champagne colour – though they chose varying styles. Jennifer’s strapless version is the J.Crew Arabelle long dress in silk chiffon, which retails for £365. ‘We kept the day’s colours as understated as possible because we wanted the natural beauty of the land to stand out,’ says the bride. The wedding took place at a farm near where Jennifer and her brother Blaine were raised in Louisville, Kentucky. Jennifer has always been close to Blaine, as well as her other brother Ben. In her Golden Globes acceptance speech, she famously gave a shout-out to her older brothers. ‘I wouldn’t be who I am today without you being mean to me, but then really supportive and loving,’ she said.